class="post-template-default single single-post postid-339557 single-format-standard custom-background group-blog header-image full-width singular wpb-js-composer js-comp-ver-5.7 vc_responsive"
ELGIN, Minn. (AP) — Fred Wescott never planned on a career in apples. But a family orchard and a call to help market apples more effectively for local growers put him on a path to create a new company and consolidate apple distribution along the Upper Mississippi River region. In fact, calling Minnesota’s collection of orchards an industry back in those days was a bit of a stretch. And Wescott yearned to travel, and he considered law or politics as a potential future occupation. But his father’s hobby orchard near Elgin was producing apples about the time Wescott finished college, and the orchard, if it was to become profitable, needed a business plan that would make it survive and thrive. In fact, he said, the orchard industry has two main paths for business success. One is the model of local orchards that are seasonal businesses. Apples are sold direct to customers, generally on the farm or at farmers markets, with some local retail sales. Those apple orchards, he said, often provide entertainment — wagon rides, corn mazes or music — along with a host of other produce that are sold alongside the apples. The other model is a commercial wholesale market, something that Minnesota’s apple industry seriously lacked back in the 1970s when Wescott decided to tackle his orchard’s sales problem. “By all rights, we shouldn’t have an apple industry at all,” said David Bedford, a research scientist and apple breeder working in the University of Minnesota Horticultural Research Center. Between the short growing season and cold winters for apples in Minnesota, and the competition from apple powerhouse states such as Washington, Michigan and New York, Bedford said, Minnesota comes to the apple market at a disadvantage. Then, there’s those business models. In Minnesota, about 90 percent of orchards are the direct-sale variety and about 10 percent are part of the wholesale business. What Wescott did is bring together a collection of growers to provide apples to retailers who were looking for a consistent, quality supplier in the region. Thus was born the Mississippi Valley Fruit Company in 1999. When Wescott looked at his father’s orchard — and the orchards run by other farmers in Southeast Minnesota and western Wisconsin along the Mississippi River — he saw a problem not only for growers but the problem facing retailers. The problem for retailers, he said, was they didn’t want to deal with 10 or 20 growers knocking on their door trying to sell a few bushels of apples for a few months of the year. That left them with too many growers to juggle, different levels of quality, and a supply that would run only from August to maybe December. “When we looked at the regional apple industry, it needed to make significant changes or become obsolete,” he said. So over the next few years he began consolidating local growers under the MVFC banner, gathering the region’s growers together to create a presence in the wholesale industry. “That was a big transition to see if we could restructure the industry to be sustainable,” he said. Eventually, the wholesale company was made up of about 20 local growers along the Upper Mississippi River corridor — on both sides of the river — from Stillwater and Chippewa Falls, Wisconsin, in the north to La Crescent in the south and as far west as Mankato. Four regional packing centers take care of the packing, storage and distribution. MVFC handles the marketing and sales for its growers. Fred Kappauf, owner of Sekapp Orchard — a farm-to-market grower in Rochester — said building the wholesale business has benefited apple growers in Southeast Minnesota and western Wisconsin, even if he is not part of that group of growers. “It provides a very valuable service for the apple growers,” he said, referring to the work done by Pepin Heights Orchard and, particularly, the Wescott’s MVFC. “He worked very hard to get that shelf space” in retail stores, Kappauf said. Of course, all of this was made easier thanks to the University of Minnesota’s apple breeding program and the well-known Honeycrisp apple. Of the 27 apple varieties that have become commercial successes in the 110 years of the breeding program, Bedford said, none have had the impact of the Honeycrisp. “It’s the tsunami that hit the apple industry around the world, he said. For Wescott and other Minnesota growers, it meant something else: A commercial success that not only can be grown in Minnesota’s climate but was designed for Minnesota’s climate. It’s the first apple to replace the Minnesota favorite Haralson, which was released in 1922 and spent about 80 years atop the state’s production charts. But the Honeycrisp — and its offspring such as the SweeTango, First Kiss and Pazazz — have given the region apples that thrive and are commercially successful. Those cultivars also give Minnesota orchards a longer harvest season. First Kiss can be harvested in August. Other varieties are harvested in late September and through October. That won’t get you year-round apples, though. 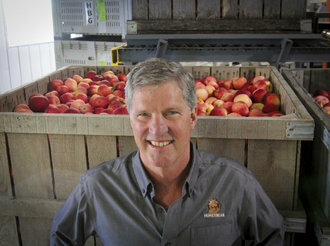 To help reach his goal, in 1996 Wescott bought orchards in Washington state, which has a longer, warmer growing season. That meant not only extending the harvest season but being able to grow different apples that can’t be grown in Minnesota. He also signed production partnership deals with growers across North America in places such as New York state and Nova Scotia. Those apples are shipped to the Elgin facility, sorted, packed and shipped to retailers. Apples grown locally are stored in rooms that not only are climate controlled, but are then filled with nitrogen to prevent spoiling due to oxygen in the air. Still, Wescott said, that wasn’t enough to make it through 12 months of packing and distribution. So in 2001 he signed production agreements with growers in Chile. In fact, if you’re eating a Honeycrisp or a Pazazz between May and July, chances are that apple was grown in the Southern Hemisphere, shipped to Elgin, packed and delivered to your local grocer. Between his growing and packing operations in Washington and the Minnesota-Wisconsin side of the company, Wescott’s wholesale apple business amounts to about 3 million bushels of apples a year. Considering the whole Wisconsin-Minnesota apple industry — wholesale and retail — amounts to about 1.5 million bushels, Wescott is a big player in the region. But it’s crab apple-sized compared to the apple industries in Washington state, New York and Michigan. “We’re insignificant to the industry,” he said. But delivering regionally grown apples to regional buyers — the company’s local production is sold mostly in the five-state area — is important to Wescott. “The best version of the Honeycrisp is one grown regionally because it was born out of the conditions here,” he said. Still, Minnesota’s wholesale apple business — much of it centered right up the road in Elgin — is part of a worldwide, year-round industry.